Settle into God’s truth that you can not be moved. Live with eyes fixed on the Savior and worship God in the beauty of holiness. Bear witness by your life to the truth of the words: The statutes of the Lord are right, rejoicing the heart; the commandment of the Lord is pure, enlightening the eyes. More to be desired are they than gold; yea, than much fine gold; sweeter also than honey and the honeycomb. Psalms 19:8, 10. 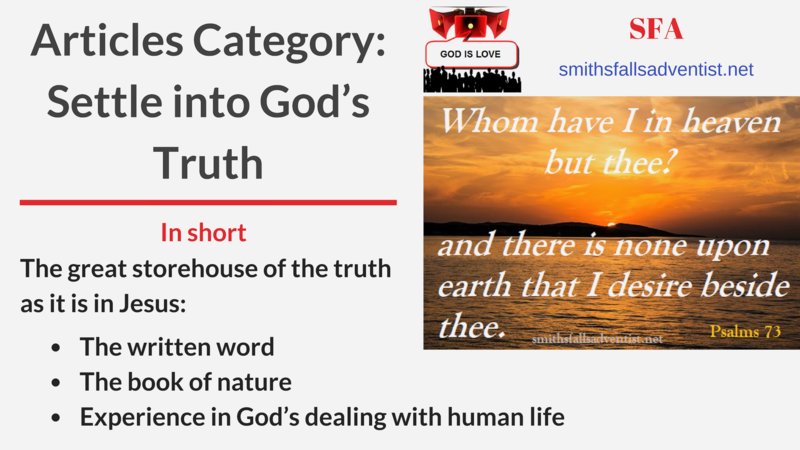 All articles and media here are intended to help you settle into God’s truth that you can stand on sound doctrine. For the time will come when they will not endure sound doctrine; but after their own lusts shall they heap to themselves teachers, having itching ears; And they shall turn away their ears from the truth, and shall be turned unto fables. 2 Timothy 4:3,4.